The purpose of the future value annuity tables is to make it possible to carry out annuity calculations without the use of a financial calculator. They provide the value at the end of period n of 1 received at the end of each period for n periods at a discount rate of i%. 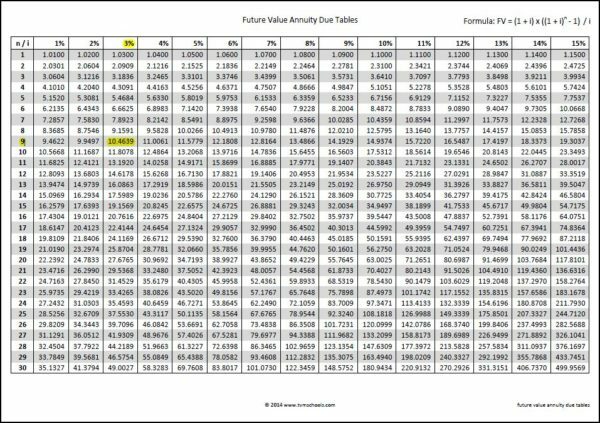 Future value annuity tables are used to provide a solution for the part of the future value of an annuity formula shown in red, this is sometimes referred to as the future value annuity factor. What is the future value of 6,000 received at the end of each year for 8 years, if the discount rate is 4%? The future value annuity factor of 9.2142, is found using the tables by looking along the row for n = 8, until reaching the column for i = 4%, as shown in the preview below. The future value annuity table is available for download in PDF format by following the link below. Future value annuity tables are one of many time value of money tables, discover another at the links below. Users use these future value annuity tables at their own risk. We make no warranty or representation as to its accuracy and we are covered by the terms of our legal disclaimer, which you are deemed to have read. 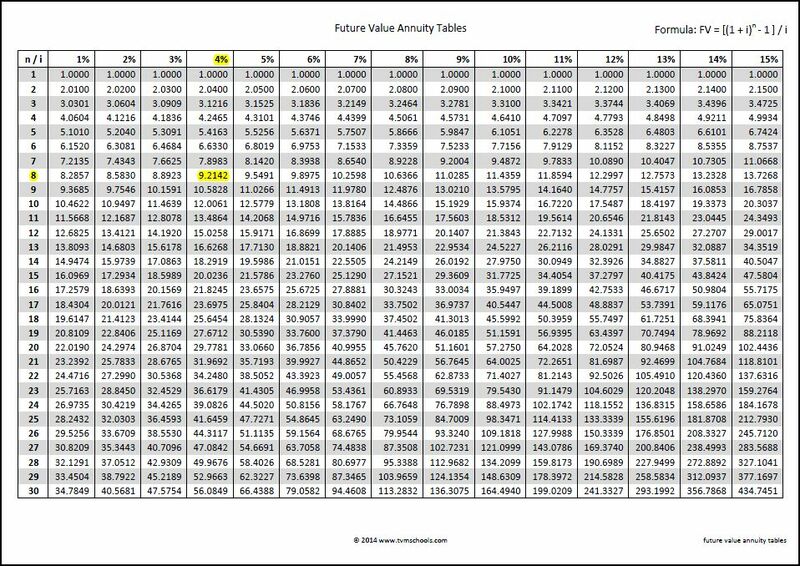 This is an example of a future value of an annuity table that you might use when considering how to calculate annuity values. It is purely illustrative of a future value of annuity table. This is not intended to reflect general standards or targets for any particular business, company or sector. If you do spot a mistake in these time value of money tables, please let us know and we will try to fix it.